The first novel in ten years from award-winning, million-copy bestselling author Leif Enger, Virgil Wander is an enchanting and timeless all-American story that follows the inhabitants of a small Midwestern town in their quest to revive its flagging heart Midwestern movie house owner Virgil Wander is "cruising along at medium altitude" when his car flies off the road into icy Lake Superior. Virgil survives but his language and memory are altered and he emerges into a world no longer familiar to him. Awakening in this new life, Virgil begins to piece together his personal history and the lore of his broken town, with the help of a cast of affable and curious locals?from Rune, a twinkling, pipe-smoking, kite-flying stranger investigating the mystery of his disappeared son; to Nadine, the reserved, enchanting wife of the vanished man, to Tom, a journalist and Virgil's oldest friend; and various members of the Pea family who must confront tragedies of their own. Into this community returns a shimmering prodigal son who may hold the key to reviving their town. With intelligent humor and captivating whimsy, Leif Enger conjures a remarkable portrait of a region and its residents, who, for reasons of choice or circumstance, never made it out of their defunct industrial district. 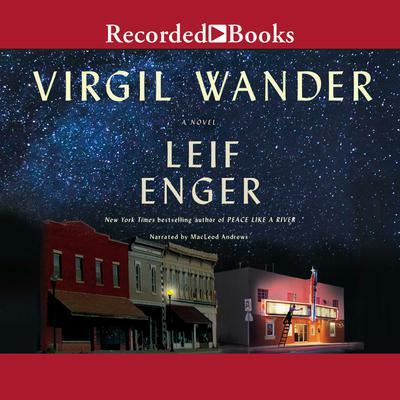 Carried aloft by quotidian pleasures including movies, fishing, necking in parked cars, playing baseball and falling in love, Virgil Wander is a swift, full journey into the heart and heartache of an often overlooked American Upper Midwest by a "formidably gifted" (Chicago Tribune) master storyteller.